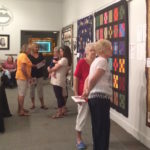 The Apple Country Quilt Show opened on Friday, July 15 at and runs until August 21 at the Markay Cultural Arts Center. Several quilts are on display. “O-So-Subtle” was quilted by Pamela Jacobs of Jackson. This quilt was made for the Wesley Youth Auction, which will be held on Nov. 19 at Wesley United Methodist Church. The request was for an Ohio State University quilt. The quilt is machine stitched and quilted. This quilt is not for sale. “Stars over George Town” by Marlene Simpson of Jackson. This 100 x 108 inch quilt is hand stitched and hand quilted. It was made from 2013 to 2015. This quilt is not for sale. “Sun Bonnet Sue” by Paula Forshey of Jackson, is hand pieced, hand appliquéd and machine quilted. It was made for her grand daughter, Chloee, in 2015. This quilt is not for sale. “Bali Wedding Star” by Norma White of Jackson was machine stitched and hand quilted in 2015. This quilt is not for sale. “Hawaiian Quilt” owned by Barb Hammond of Jackson. This quilt was hand appliquéd by Barb Hammond and machine quilted by Amanda Watters. This quilt is not for sale. “Something to Crow About” was quilted by Naomi Worthington of Jackson. This entry was hand appliquéd and quilted. She made this in June 2016. This quilt is not for sale. Vivian Bevins of Jackson quilted “Windowpane”. This is a nine-patch pattern. It is machine pieced and machine quilted. This quilt was finished in 2016. This quilt is not for sale. 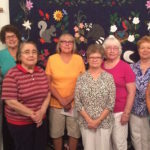 “Bloomin’ Nine Patch” was quilted by Margaret Pigge of Wellston. This nine-patch patterned quilt was machine pieced and machine quilted. It was finished in 2014. This quilt is not for sale. “Log Cabin” is by Diana Arthur of Jackson. The log cabin patterned quilt is machine pieced and machine quilted. It was finished in 2015. This quilt is not for sale. “Bible Studies Quilt” is owned by Denise L. Armstrong of Jackson. This quilt represents 73 quilt patterns. It was machine stitched by Denise Armstrong and machine quilted by Amanda Watters. It took over a year, from 2014-2016 to complete. This quilt is not for sale. The lady who designed the quilt studied the books of the Bible and Apocrypha. The blocks represent the 39 books of the Old Testament, seven books of the Apocrypha and 27 books of the New Testament. For each block she chose a quilt design, which represented the meaning of the book, in her opinion. “Blue Streak” is owned by Sharon Brown of Jackson. This quilt is machine stitched by Sharon Brown and machine quilted by Amanda Watters. It was finished in 2015. This quilt is not for sale. “Outside My Kitchen Window” is by Cynde Wood of Jackson. This quilt is an appliqué animals. It is hand stitched and machine quilted. It was made in March 2015. It took two years to collect, dye and paint some of the fabrics for this quilt. She loved every minute working on it. This quilt is not for sale. “Harvest Time” is owned by Denise Brown of Jackson. It is a seasonal pattern. This quilt was machine stitched by Denise Brown and machine quilted by Amanda Watters. It was made in the Fall of 2015. This quilt is not for sale. In keeping with our Appalachian tradition, summer art students explored music-making with washboards, and playing musical spoons, learning play-party songs, as well as singing folk songs and spirituals. They also learned of the significance of quilt patterns and their meanings and the theory of the role of quilts in the Underground Railroad. Students from Jackson, Wellston, and Oak Hill designed their own quilt squares, for the “Kids Art Quilt”, complete with their own secret messages and maps to patch together a unique quilt for you to enjoy. The free Summer Art Camp was made possible through funding from the Jackson County United Fund and the Ohio Arts Council. The Markay Gallery is open Wednesday to Friday noon to 5 p.m. and on Saturday and Sunday from 1 to 3 p.m. The Markay Cultural Arts Center is located at 269 E. Main St., in Jackson. 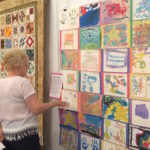 The Apple Country Quilt Show opens on Friday, July 15 at 7 p.m. and runs until August 21 at the Markay Cultural Arts Center. 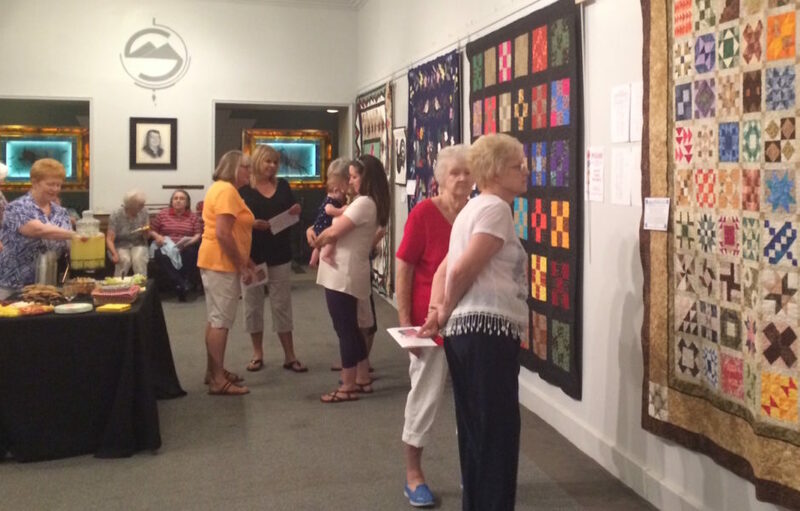 Several quilts are on display. The Markay Gallery is open Wednesday to Friday noon to 5 p.m. and on Saturday and Sunday from 1 to 3 p.m. The Markay Cultural Arts Center is located at 269 E. Main St., in Jackson. Pictured from left are Naomi Wothington, Marlene Simpson, Vivian Bevins, Sharon Brown, Denise Brown, Norma White, Denise Armstrong and Paula Forshey. Southern Hills Arts Council Board of Trustees member Phyllis Michael is pictured looking over the Kids Art Quilt, where students from Jackson, Wellston, and Oak Hill in the free summer arts classes designed their own quilt squares, for the “Kids Art Quilt”, complete with their own secret messages and maps to patch together a unique quilt.